It's been too long since I made some bialys. 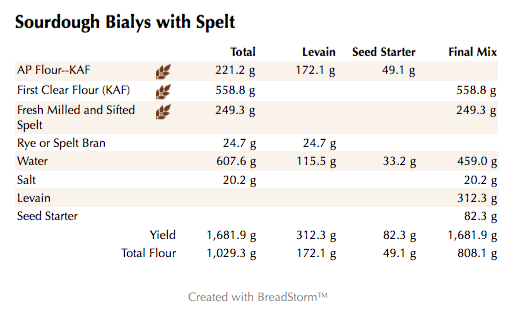 Bialys seem to be the forgotten stepchild of bagels it seems :). My original formula and procedure is here. 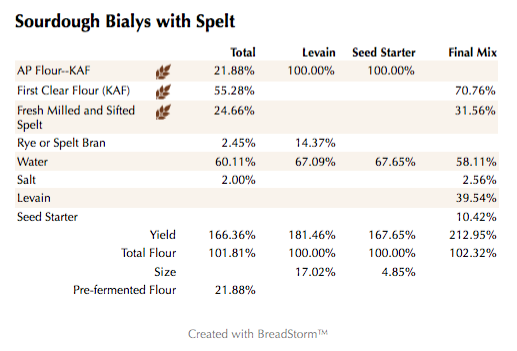 I also bulk fermented the dough instead of shaping the bialys and then refrigerating them. Other than that you can follow along with the original instructions. For the dough I bulk fermented after 3 rounds of S & F's every 25 minutes and let the dough sit out at 78 degrees for 1.5 hours total. The next day I took the dough out and let it sit for around 1.5 hours at 78 degrees, shaped them into balls, let them proof for 1.5 hours, shaped per original recipe and baked. right over I'll take one cheese and one onion since you don't have a chorizo, onion and Cotija one:-) Bet they are delicious though. Lucy hopes you and the black ones had a great Labor Day. Come on down or over! Once Lucy perfects that transporter thingy you are welcome any time :). I wish I had some chorizo and Cotija to try on these....I was thinking it may make Stan send a Golem after me, but it may be worth the risk! Glad you like them and Happy Baking to you and Lucy. I need to try those one day! I have never tried bialys and your look amazing! I hope you give them a try. You can try the non-bastardized version in my original posts first or just jump right into the fire with this version. Great post Ian, happy baking! Glad you like them and hope you give a version a try one day. Sadly, the flowers are coming to an end soon with the Flox some of the last flowers to bloom before fall sets in. We have a few fall flowers but mostly the hydrangeas will still be around for a while with everything else wilting away. and Bialystoks. Yep, that's what we always called them until the name got shortened. I think that I liked them every bit as much as the bagels we'd pick up, still piping hot, from Rubenstein's Bagels on those frigid winter weekend mornings. Glad you like them. You're right there is nothing like piping hot bagels and bialys 😋. As usual perfection in all things !! My flowers are coming to an end ....but I have Fall crocus !! If you have never seen them you are in for a treat on line. They are amazing little bulbs and SO cheerful yellow. I am going to look for the other kind that are purples and whites as well. and get planting for next year. I hope you give it a try soon. I will have to look up the fall crocus as I don't believe I have any of those. Caramelized onions, cheese....those look delicious Ian! Do you ship to Utah? Will try this when I get home in a couple of weeks. Tomorrow I'm making a batch of bacon-onion jam as a birthday gift for my son-in-law. Hopefully I can duplicate the batch I gave him last year; as usual I combined a few recipes. Wonder how that would taste as a bialy topping? 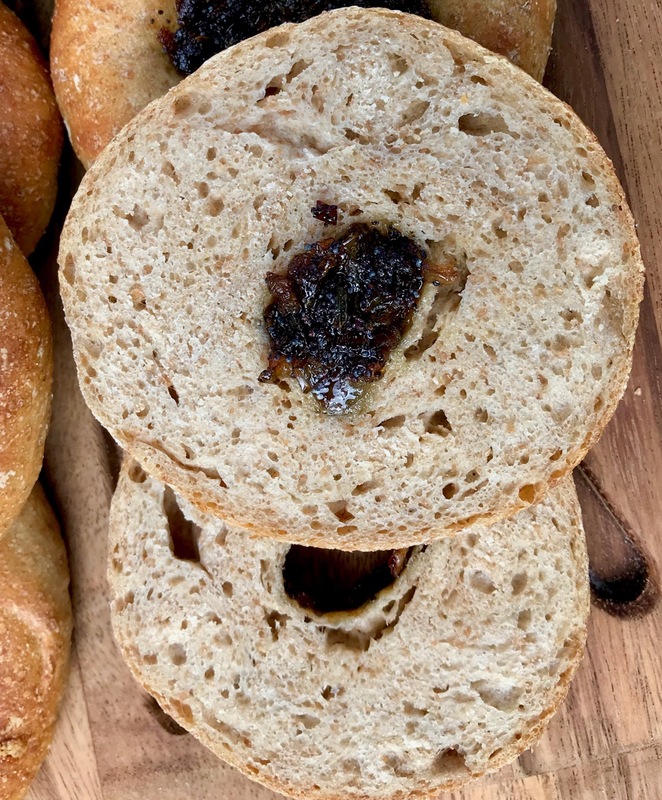 Love the idea of the bacon onion jam. It would be perfect and I will have to try it. Hope you give it a try and feel free to send some my way too 😏. 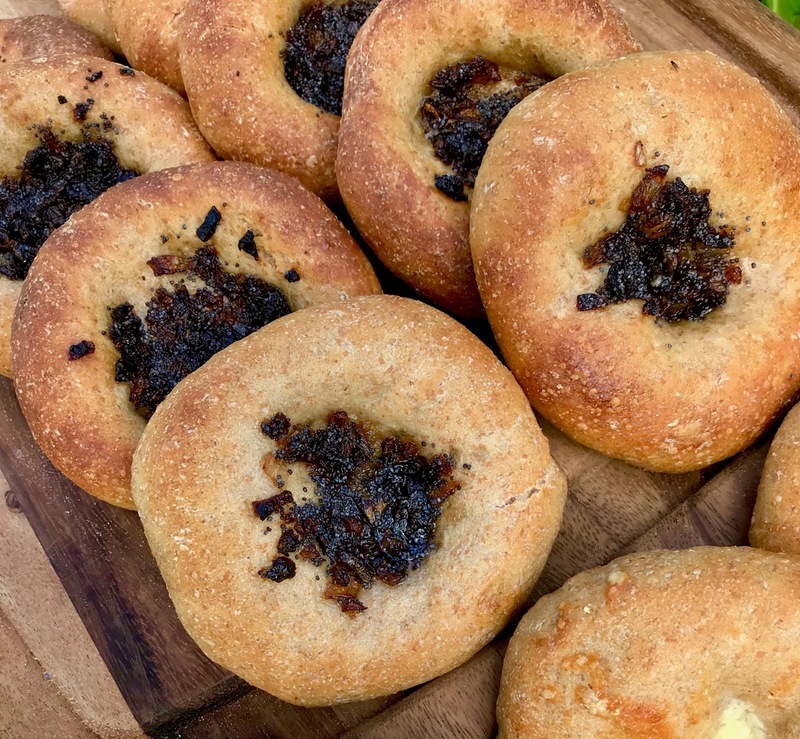 Bialys might be the next to try after the bagel-inspired bread with onions, just don't know how I will flip them without a mess. These look killer! 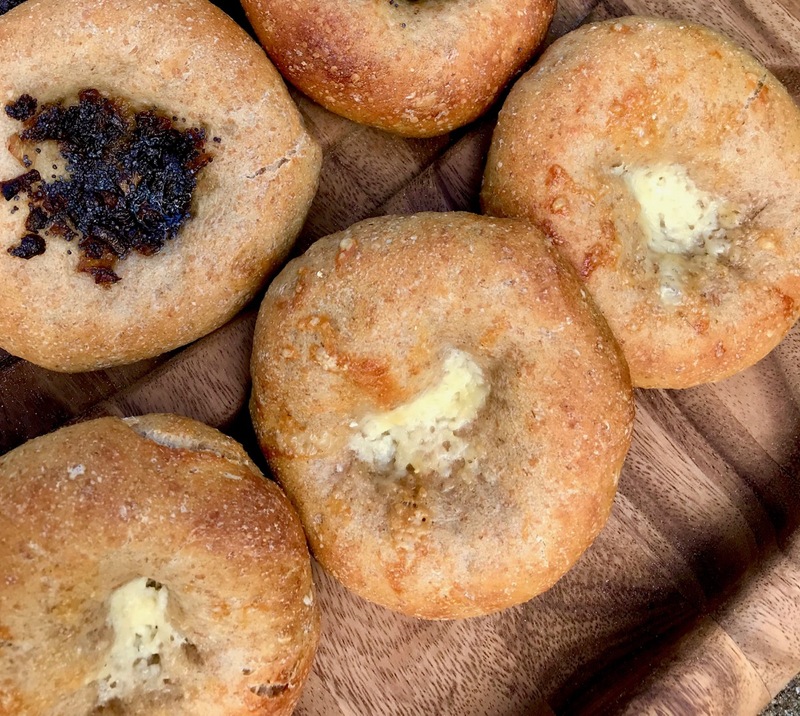 And the crumb shot at the end tells the story of the bialy's shape well. I hope you try a version one day and let me know how it turns out. Look forward to your next bake soon I hope. Glad you like them. You can use dehydrated onions per my original post if you want to try and be more authentic but I love the sound of your idea 😎. Hope to see your post on them soon. 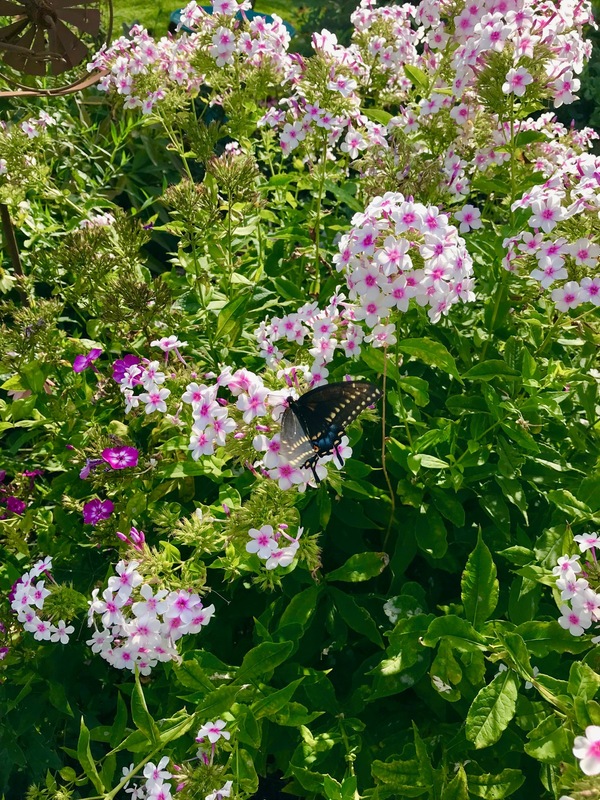 My wife kept telling me about the beautiful butterfly's hanging around our Flox so I'm happy I was able to get a nice shot.